The Franklin Downtown Partnership has planned a progressive dinner for Sunday, May 15, and invites everyone to come enjoy a night out in downtown Franklin. Building on the success and popularity of the first dinner last fall, organizers are offering delicious options at several downtown restaurants. 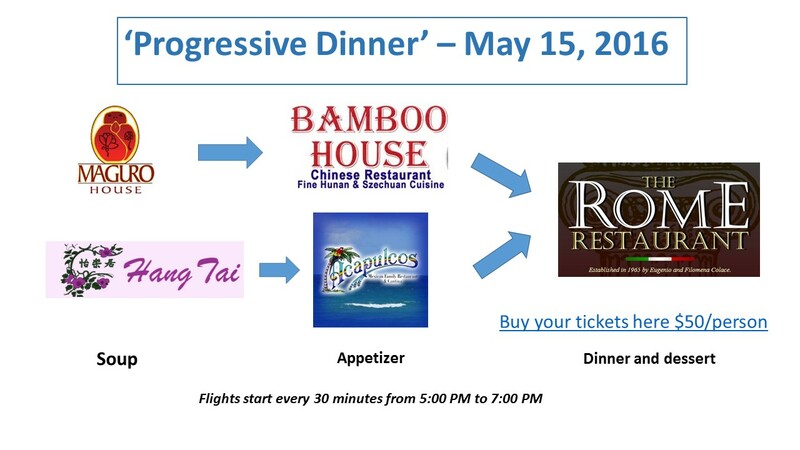 Dinner goers can also take chances to win raffle items donated by FDP member businesses. “Our Progressive Dinner is one way we are reminding our community to visit Franklin’s downtown eateries during the road construction process. What better way than to have people walking through downtown, enjoying local restaurants and entertainment with friends?” says event organizer Jane Curran, owner of Jane’s Frames and FDP board member. Diners will choose from two different flights, with each flight including soup at one restaurant, an appetizer at a second, then dinner and dessert at a third. Flights will be staggered to begin every half hour beginning at 5:00 p.m.
“Flight A” includes soup at Maguro House and appetizers at Bamboo House. “Flight B” includes soup at Hang Tai and appetizers at Acapulco’s. Both flights feature two options for dinner plus a delicious dessert at The Rome Restaurant, where local musicians will provide a musical backdrop to the festivities. Links to the page are also posted on the FDP website, www.franklindowntownpartnership.org/ and on the FDP Facebook page. Diners will choose the start time and either “Flight A” or “Flight B” when they purchase tickets online. “We are excited to bring the community together with this second Progressive Dinner,” says event co-chair Joel Carrara. Sponsorships are available for this event. Contact Jane Curran at janeframe@verizon.net for more information or with questions about the dinner. The Franklin Downtown Partnership is a non-profit, 501©3 organization made up of businesses, residents and community leaders working to revitalize downtown Franklin. The Partnership runs events such as the Strawberry Stroll, the October Stroll and the Holiday Stroll, and is involved in streetscape and design efforts, greenspace and sculpture projects. Go to the FDP website, www.franklindowntownpartnership.org, to learn more.